What is the Honey Day Ride Tandem? The Day Ride Tandem bike is just that—a bike designed to be ridden comfortably all day. More specifically, the Day Ride is for serious longer rides where comfort, stability, and performance are important in equal shares. If you’re looking for a more enjoyable ride that lasts longer, it will be difficult to find a better tailored tandem than the Day Ride. Many road tandems try to be best for racing and road riding at the same time. But, a good road tandem is really different from a proper race tandem. The Day Ride addresses these fundamental differences, and then takes serious road riding a step further by fine-tuning all aspects of the bike. 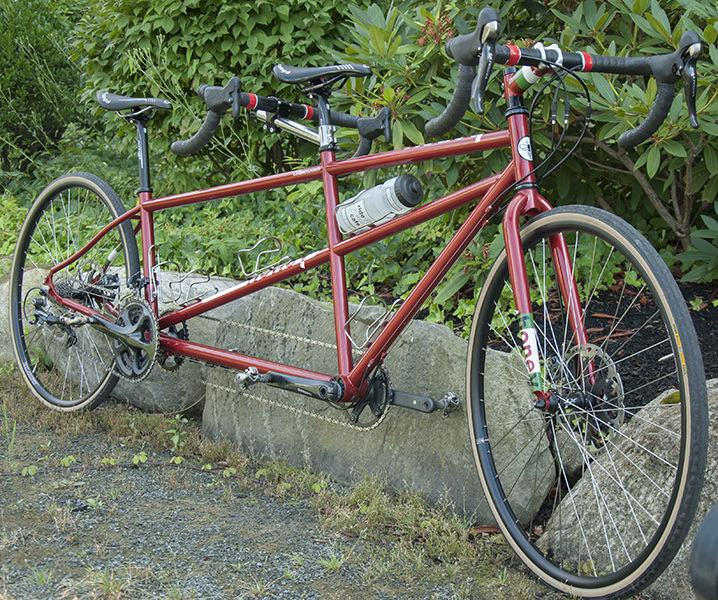 Why is the Honey Day Ride Tandem the ideal all day tandem? Handling that’s optimized for long days in the saddle, where stability and easy handling are important. o specify and source any parts you prefer. The list of new and unique aspects of the Day Ride Tandem - relative to other popular tandems - is too long for an exhaustive accounting. Here is an overview of what makes this bike special. Brake system options. The Honey Day Ride Tandem typically has mechanical 203 mm disc brakes, but we offer hydraulic disc brakes for riders that want the best stopping power. We also offer road calipers for riders who prefer the lightest weight tandem. 2:11 gear system. Contemporary shifting systems enable gearing that mimics classic triple chainring cranksets. This make the shifting system a lot smoother, have fewer issues, and creates a lighter bike. Nearly 1:1 gearing. Standard Honey gearing provides a 34 tooth chainring in the front and a 32 tooth cassette in the back. This facilitates climbing nearly any hill. We also offer custom gearing options if you're looking for lower gears. Stable and predictable handling comes first. When you're riding for a few days - or longer - at a time, having a bike that is really predicable and easy to handle becomes a joy. We designed the Day Ride Tandem with a number of geometric features that mean stable: long wheelbase, low bottom bracket, low center of gravity, high front-end, and more. The toughest of tubesets. All day tandem riding is tough on your body, mind, spirit, and your bike. We took care of the bike's toughness; you take care of the rest. Excellent tracking and traction: The Honey seat stays provide improved traction and predictability on any decent and on any road surface. Excellent climbing ability: The Day Ride's Clover frame tubing employs stiff chainstays for efficient power transfer to get you up the hills faster and with less effort.